Since I started this blog about the iPhone in Canada in December of 2007, things have progressed along the way. When I first got my iPhone it was on firmware 1.1.1, and I had to wait two weeks for an unlock to come out. Once it was released, I activated, jailbreaked, and unlocked my way to firmware 1.0.2. Currently, my iPhone is currently on the stable 1.1.1 firmware. Now that there has been a release of ZiPhone, the easiest way to unlock 1.1.2 and 1.1.3 OTB (out of the box) iPhones, I’ve received lots of emails asking about the status of iPhones in Canada. So I thought I’d take some time to come up with a Frequently Asked Questions (FAQ) for all you newbies out there, looking to buy an iPhone. Some of this information may be old hat to you iPhone veterans, but it’s always good to review. Here we go with answers to your questions! Will an iPhone work in Canada? Can I just pop in a SIM card and use it in Canada? An iPhone will work in Canada, but it needs to be unlocked. You CANNOT just pop in your SIM card for it to work. It must be unlocked to be used with Rogers or Fido (the only GSM networks in Canada). It will NOT work with Telus or Bell. That’s right…it will NOT work with Telus or Bell (they are CDMA networks)! Where can I buy an iPhone? I want one soooo bad! What features will work? How Do I Go Abouts Buying an iPhone in the USA? Will I have to sign a contract? What about firmware? Will I have to pay taxes/duties on my iPhone? Walk into an Apple store, buy a phone with your credit card and provide your postal code. Some stores have been asking for US zip codes and checking for ID. Your mileage may vary. Current 8GB and 16GB models in stores most likely will be on 1.1.3 firmware. Recently a new unlock was released to activate and unlock your iPhone. Check your iPhone firmware here. Taxes & duties: you will pay the local State tax in the USA on your iPhone purchase. When you come back to Canada, you will have to pay GST/PST if you declare your phone (which you should as it’s not worth the trouble to get red flagged) but NO duty. For example, to buy an iPhone from WA State and bring it back to Canada, after State taxes and PST/GST, the total will come to $490CDN. Since our dollar is pretty much on par, this is the time to purchase baby!! I have my iPhone. Now what? Your iPhone needs to be “activated”, “jailbreaked”, and “unlocked” (check out what all this terminology means here). New iPhones are running 1.1.2 and 1.1.3. Follow the guide posted about using ZiPhone. Unlocking should take less than 3 minutes if you follow the instructions correctly! What are these “SIM” solutions I keep hearing about? Previously, iPhones that came with 1.1.2 firmware could not be unlocked. However, someone came out with a SIM “clone” that would trick your iPhone into believeing it was an AT&T SIM card, allowing you to use any SIM from around the world. Read about my StealthSIM review here. If you want an easy way to unlock 1.1.2 iPhones, all you have to do is pop in a StealthSIM into a jailbreaked phone, and voila! Should I update my iPhone’s firmware? I want to update to 1.1.1/1.1.2/1.1.3! Here’s my motto when it comes to these things: if it ain’t broke, don’t fix it. So many people have had itchy fingers to update their iPhone’s firmware, only to get stuck at a certain stage where nobody can help them, rendering their once perfectly working iPhone useless. Unless you are absolutely sure of what you are doing, I would recommend sticking with your iPhone’s current firmware! Check out my Top Posts for more guides on updating your firmware! How do I use my iPhone with Rogers or Fido? If you’re an existing Rogers or Fido user, just pop in your Rogers/Fido SIM card into the iPhone. Not sure how to remove the iPhone SIM tray? Read here for instructions! When is the iPhone being released in Canada? If I had a nickel for every time I’ve been asked this question via email, I’d be a millionaire! 🙂 Nobody knows, but it should be coming out sometime this year–but to be honest, it’s really up in the air! Will my iPhone be affected if/when Rogers/Fido comes out with the iPhone? Will anything change? Your iPhone will work fine and nothing will change. Your monthly plan will not change. It’s just like using any other unlocked GSM phone with Rogers/Fido. Nothing will change. I want to use a data plan with my iPhone. What are my options? Welcome to Canada, where we have some of the most expensive data rates in the world! Rogers recently released a revised data plan but it doesn’t apply to the iPhone. Your best bet is the $65/1GB monthly plan–if you are desperate for data. How do I setup EDGE settings on my iPhone? I have posted instructions to setup EDGE here. The voicemail icon has a red dot on my iPhone. How do I remove it? Read my post here on how to remedy this situation and receive SMS voicemail notifications. I’ve unlocked my iPhone! Yes! I need a case to protect my new investment. Any suggestions? 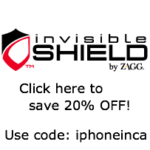 I am using the InvisibleShield with my iPhone. It’s a clear plastic film that protects against key scratches but not drops. Moneyback guarantee and a lifetime warranty! Another similar film is the BestSkinsEver. How do I download 3rd party applications to my iPhone? 3rd party applications are installed via the program called Installer on your iPhone. This is where you will find the installs for iAno or PocketGuitar. I want to put on ringtones. What’s the easiest way? iPhoneRingToneMaker is worth its weight in gold. You can edit, create, and transfer an mp3 ringtone to your iPhone in less than one minute. I want to download content to my iPhone. Where can I find downloads? Check out my iPhone Downloads page to find the latest websites to get TV shows, movies and music onto your iPhone. I want to become an iPhone “Yoda”…can you show me the ways? I’d love to, but I can’t. For starters, reading about the top iPhone tricks and tips you didn’t know about is a good start! My speaker volume is so darn low. I’m missing calls. How can I fix this? This problem can be pinpointed (no pun intended, hehe) here. How do I contact you? I want to ask you a question that you have not answered. I emailed you a while back. How come you didn’t respond? How do I keep up to date with your posts and the blog? Subscribe to my RSS feed if you haven’t already…it’s the best way to track what’s happening with the iPhone in Canada.